The Asian Development Bank’s plantation plans in Laos are taking place almost completely in secret. By Chris Lang. Published in WRM Bulletin 68, March 2003. If the Board agrees to fund the project, it will be the second plantation project that the ADB has funded in Laos. The ADB’s US$11.2 million Industrial Tree Plantation Project started in July 1994, with a target of establishing more than 9,000 hectares of fast-growing tree plantations. According to the ADB’s project description, the new project “will build on the successes and lessons learned from the ongoing Industrial Tree Plantation Project”. In fact, the project does none of these things. ADB-funded plantations are replacing forests with monocultures. Villagers are not meaningfully involved in the decisions which cause them to lose their land and forest to eucalyptus plantations. 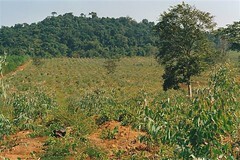 Economically, the plantations are only viable because of subsidies provided by the ADB and the Lao Government. Under Lao Forestry Law, plantations are exempt from land tax, and the company BGA Lao Plantation Forestry, which benefits from cheap ADB loans, pays only 5 per cent income tax. Meanwhile, the Lao Government gave BGA the 50 year land lease for its plantations rent free, in return for a share in the project (see WRM Bulletin 43). 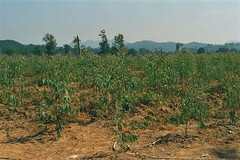 ADB-financed eucalyptus plantations in Laos. The ADB’s project documents contradict Édes statement. According to a 1995 report by consulting firm Jaakko Poyry, plantations are to be established on “unstocked forest land”. The ADB’s consultants define unstocked forest land as “previously forested areas in which the crown density has been reduced to less than 20%” and “abandoned ‘hai'” [swidden fields]. This definition allows companies to describe villagers’ community forest, swiddens, grazing and common land as “unstocked forest”. ADB-funded eucalyptus plantations planted on previously forested land. Bartlet W. Édes notes that the ADB project has established “a policy framework for developing sustainable industrial tree plantations.” However, neither the policy framework, nor the policy studies produced for the ADB are publicly available. In 1999, the ADB funded a study entitled “Current Constraints Affecting State and Private Investments in Industrial Tree Plantations in the Lao PDR” (see WRM Bulletin 52). Snimer Sahni, project officer at the ADB, stated that the document is not available to the public. The ADB’s consultants have since produced a “National Strategy for Sustainable Plantation Forestry”. Akmal Siddiq of the ADB declined to answer requests for this document. Once again, Édes’ statement is misleading. Villagers do not have the power or sufficient information about the impacts of eucalyptus plantations to bargain with plantation companies. For example, in company documents, BGA classifies up to 48,000 hectares of the land leased to the company as shifting cultivation, grazing land or degraded forest. This is, in other words, land that is currently used by villagers. Once villagers realise the problems associated with fast-growing tree plantations, they are reluctant to hand over their land to companies. In early 2001, the sub-district leader of Xiang Khai sub-district in Xaibouli district told independent researchers, “Eucalyptus plantations are causing forest, soil and water resource degradation. I do not want anyone to grow any more eucalyptus trees in my sub-district” (see WRM Bulletin 59). Monsanto defines its glyphosate products as “broad-spectrum, non-selective herbicides.” Put simply, glyphosate herbicides will kill just about anything green with which they come into contact. Glyphosate herbicides are sprayed three times a year between the straight rows of eucalyptus trees in the ADB-funded plantations. The herbicide ensures that nothing grows in the plantations other than trees. Villagers’ knowledge and uses of the wide range of plants that grow in the forest are being destroyed as their forests are converted to monoculture. Perhaps not surprisingly, the ADB is reluctant to encourage an open debate on the impacts of the ADB-funded plantations. The ADB has organised two workshops, which were attended by World Wildlife Fund, World Conservation Society and the World Conservation Union (IUCN). This, according to ADB’s Akmal Siddiq, indicates that the project is being prepared with the “active cooperation of and consultation with all the stakeholders”.